Today finds us digging out from the snow that fell over the last two days and preparing for the icy mix that is predicted for overnight. The last of the livestock barn has been scooped and all the animals have been fed and all have access to plenty of water. Our second batch of chicks (from http://www.mcmurrayhatchery.com/index.html are scheduled to arrive sometime this week. The good news is that temperatures are on the rise to above freezing for the week. The first batch of chicks are a couple weeks old now and are staring to grow their first real feathers. This second batch will also be 4-H projects and of the egg-laying variety. 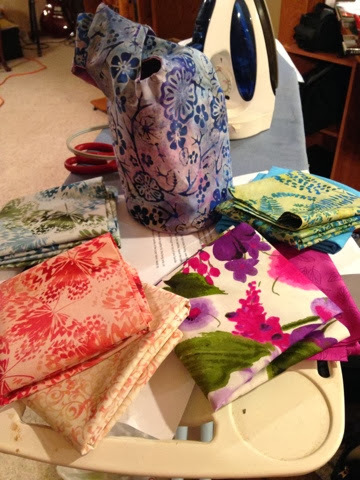 A couple weeks ago I needed a boost and went back to the fabric store and found some half yards of beautiful fabric and today decided to start a new sewing project. 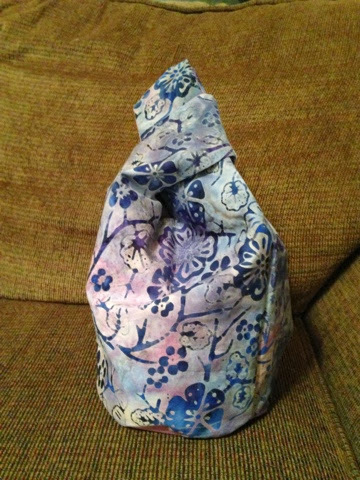 It is the Japanese Knot Bag that I found located here http://showyourworkings.wordpress.com/2008/03/03/japanese-knot-bag/. Now to search for the right yarn for the project bag. I think given my recent purchases I will be setting at the sewing machine often in the next several weeks. .This weekend has also found me checking into the webpages of a few more colleges that have majors that may interest my oldest teen. He in his mind has picked the ideal one already and feels that the search is over. Chances are in a year or so he and I will both know the answer... to be continued.